Group circulates petition to ban red light cams in Toledo. As a grassroots liberty activist organization, we need your financial help. Please make a small donation to help us advocate to protect your and your family’s liberty. We operate entirely on contributions. 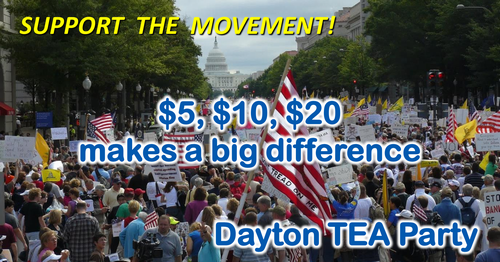 The Dayton TEA (Totally Engaged Americans) Party is organized as a Limited Liability Corporation (LLC) operated as a non-profit organization. The reason for being a LLC, rather than being a IRS-designated 501(c)4 political organization, is due to the IRS’ efforts to suppress our freedom of speech back in 2009-2010 when the DTP was first organized. (Yes, we got those letters from Lois Lehner. Rather than comply with the unwarranted demands, the DTP was organized as an LLC.) Please note that your donations are NOT tax deductible when determining your taxes, generally just like any politically-active 501(c)4 organization. The DTP has no paid staff. Our efforts are focused on communicating critical liberty-preserving information to the community, advocating for Americans’ liberty, and supporting the community liberty groups across the Miami Valley that are a part of or friends with the DTP. If you are able to help, please Click the Donate button below. This will take you to a PayPal payment page. Please note that we are charged a small fee for processing your donation. A minimum donation of $5 is suggested. Do you share our core values? (1) Protecting and defending the U.S. Constitution, the Bill of Rights, and the Rule of Law; (2) Promoting limited, effective, and transparent local, state, and federal governments; (3) Promoting personal and governmental fiscal responsibility; (4) Promoting the free market system; and (5) Assuring the integrity, transparency, and accountability of all appointed and elected government officials. © 2019 Dayton (OH) TEA Party.